Atrix Express Plus IPM HEPA Vacuum w/ Clear Hose was designed to be used for bed bug treatments as a way to safely collect bed bugs and their eggs within cracks and crevices into a self contained HEPA filter. The Atrix Express offers the power of a larger HEPA vacuum weighing in at only 4 lbs. The Atrix Express HEPA vacuum is a great tool for anyone dealing with bed bugs including individuals, pest control operators, hotels and property managers. Unlike other vacuums, the Atrix Express was designed for bed bugs and other crawling insects utilizing a self contained HEPA filter and plugs to ensure nothing gets out after usage. The one pint capacity self contained HEPA on the Express is not quite as large as the one gallon Atrix Green Supreme HEPA we carry, but the Express is more portable than the Atrix Green Supreme at just 4 lbs. The Atrix Express is for those looking for a high power vacuum that's very portable and lightweight. The vacuum is used during the cleaning process of a bed bug job to pickup as many live or dead bed bugs, bed bug feces and eggs as possible along mattresses, box springs, baseboards cracks and crevices. Using a HEPA vacuum for bed bugs is a great way to quickly reduce the bed bug population before steam, mattress covers, powders and sprays are introduced. PORTABLE - Weighing just 4 pounds, the Atrix Express Plus IPM vacuum is one of the lightest portable vacuums available. It also comes complete with all accessories shown above. FILTRATION - HEPA FILTER (99.97% EFFICIENT @ 0.3 MICRON). HEPA filtration reduces the risk of virus and bacteria dispersion. 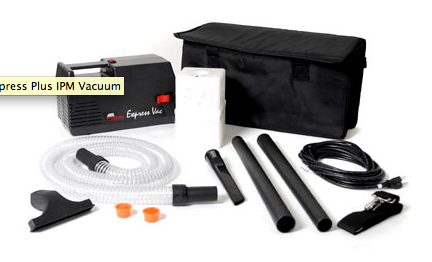 CONVENIENT - The Express Vacuum is easy to operate. The replacement cartridge filters install with a snap and without mess. POWERFUL - Atrix has built in a new, powerful motor making the Express Plus as powerful as most of the larger service vacuums. Ideal for bed bugs and bees. Q: Will this vacumn clean up/vacumn the bed bug powders like shell flour without clogging? I don't have any information about this vacuum's performance in cleaning a powder as fine as diatomaceous earth. However, DE powder shouldn't be scattered in open areas where you would need to vacuum it up, anyway. That powder is intended to be applied to deep cracks and crevices that bed bugs are likely to be hiding in, like along baseboards, floorboards, and the edges of the carpet. When applied correctly, you won't be able to see or reach the powder. Q: How long could I expect a filter to last? I don't have solid numbers available, as it varies widely based on usage. 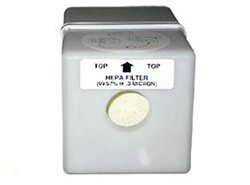 The HEPA filter canisters themselves last a very long time and are very durable, while the filtered bags will need to be changed more frequently.